I am not a fan of mayonnaise potato salads. This recipe is a mixture of several non-mayonnaise salads I have tried and it is a huge hit!!! It is a large recipe, perfect for a big gathering!! Cook potatoes in boiling water, 15 minutes or until tender. In a small bowl mix together yogurt, sour cream, tarragon, dill, garlic, mustard, paprika, salt, pepper, set aside. 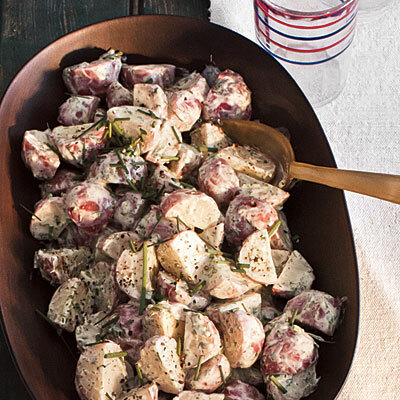 Once potatoes are done, drain, set aside, and let cool. Once cool stir together potatoes, celery, parsley, onions, and egg. Gently stir yogurt mixture with potato mixture to coat well. Cover and chill at least an hour before serving.